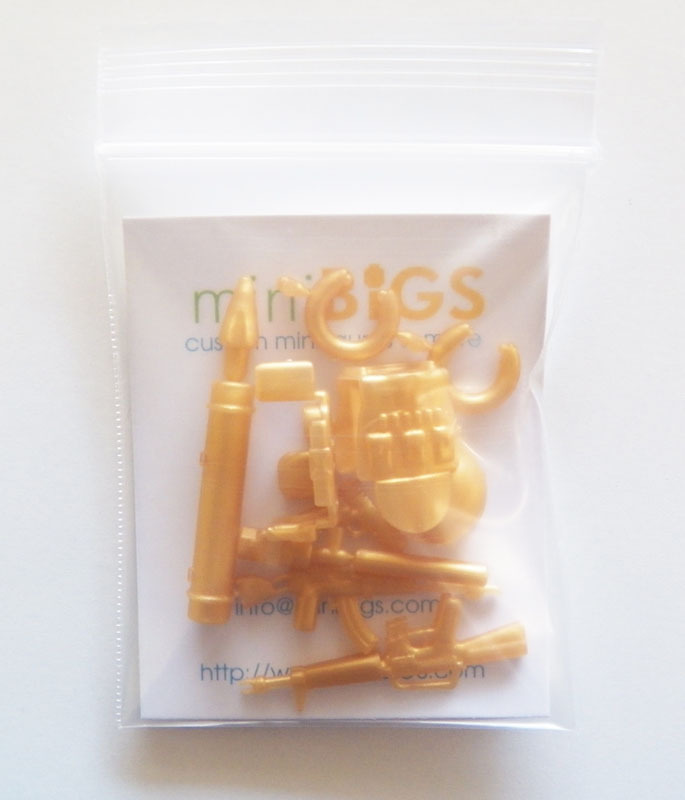 miniBIGS Minifig Blog: Our "2300" Facebook Fans Giveaway! Our "2300" Facebook Fans Giveaway! We have been gradually getting more and more fans on Facebook. I had made an announcement that once we got to 2300 fans we would give away a Golden Weapon Prize Pack made by Minifig.cat. 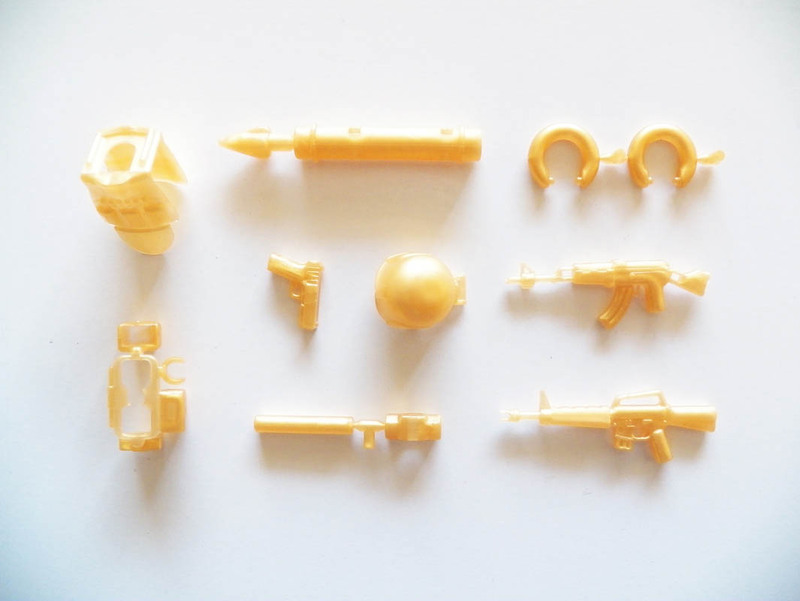 These weapons have not previously been for sale and I dont think they ever will be by. They are very, very rare. To be entered in this contest you must have "liked"us on Facebook and then just leave a comment below saying how much you like free goodies. We will use a randomizer app on April 14th to pick a winner. The winner will be announced here on our blog and also on Facebook. Once your name is announced please send us an email with your current mailing address and we will ship it out to you right away. Thanks for being a fan and good luck! I really really like free goodies. Who doesn't love some free stuff? Especially when they're super rare. If I won this, I'd have a lot of jealous and angry minifigs being blinded by the holder of this "blinged out" arsenal. I'd love to own em! However, I congratulate whoever gets em if it's not me! Free things are the best because you don't have to pay for them, someone took the kindness from their heart to give something valuable for free of charge, and you will never forget it. I personally think that when I get a free item, it makes me feel good. I know you are so kind in giving this one-in-a-lifetime opportunity to one of your 2,300 fans across the world. The chances of each person winning is .0004, less than 1%. The items you are giving away are fabulous. It would make a minifigure almost one of the lego gods. I hope you make the right choice in selecting the winner of the prize. May the best go out to all, and let the selecting begin. I love getting goodies! Especially when there FREE! If your business is big, it'll worth to buy advertising on facebook and build your own ad campaigns. Thanks for your marvelous posting! I quite enjoyed reading it, you happen to be a great author. I will remember to bookmark your blog and will eventually come back very soon. Go to best social plan for get more related topic. Have a nice evening! Really this blog is very helpful for me and my others friends. After reading your post i have got lot of information about this topic. I will remember your blog all times and share my friends. To get more related topic go to buy real like and continue reading. i realy like your site and posts . thanks..
Add us to your feed! The best stop motion music video of ALL TIME! LEGO Lone Ranger Sets are here! The Big Mak. Should We Be Scared or Hungry?